Being patient while answering any finance related questions that children may ask you as you go about your own financial matters is a challenging task. But it has a very worthy long-term outcome! TRIO World Academy Bangalore is a thriving hub of students from many cultures. Each culture has its own lifestyle: a blend of myriad qualities, behaviours, attires, and cuisine. However, there is one thing that is common across several cultures: the concept of money. Money provides a means to trade any assets you own in return for something that you need. Life skills like discipline, hard work, and politeness, subjects such as history and calculus are things that students are expected to learn as they go through their growing years. Financial literacy, although very crucial to a child’s future, is sometimes overlooked. Parents and educators often assume that it is a skill that can be picked up on the go. Money and finance are tightly interwoven with our careers, success and life in general, whether we choose to admit it or not. It is our responsibility to teach children to be financially literate. Money can be a difficult topic to speak about depending on our own cultural beliefs and upbringing. It might be especially challenging to be open with our own financial setbacks and their consequences. We might also not consider ourselves as ‘experts’ when it comes to matters of finance. As with all other behaviours, children model their money habits around those of their parents, guardians, close family and peers. One may begin speaking to children about finances early with age-appropriate money topics. You can begin by teaching them how money holds value and how it can be exchanged for goods or services. 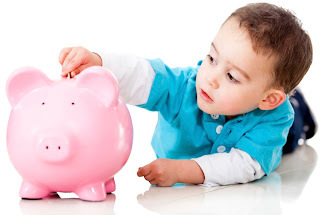 Creating a bank account for your child and introducing them to the concept of saving and various operations of banking one step at a time will be helpful. Teaching them to plan their allowance and maximize its utilization is also a valuable activity. It is necessary to set limits on indiscriminate spending. The concept of credit cards and loans can be introduced to older children. One must make them understand that using a card creates a debt against their account, which needs to be repaid. Clearing misconceptions about credit cards and interest payments goes a long way in cultivating healthy spending habits. Marketers might take advantage of kids’ need to fit in by promising them a place among the ‘in’ crowd, in exchange for buying certain products. Teaching them the concepts of ‘needs vs. wants’, and helping them allocate a suitable portion of the allowance for the wants, can help them counter the strong influence of marketing and advertisements.